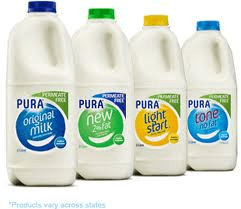 Peninsula Dairies has served the Peninsula for over fifty(50) years and provided quality Australian produced milk and dairy products at competitive wholesale rates. We are local residents and employ local residents who are all part of the Peninsula family. We thus have an excellent perception and understanding of the needs and requirements of our valued clients and residential needs, as management is local and available, there is full access and ready communication. Our clients always have access to management. All of our clients are valued and most important and we have a commitment to attending to any concerns or inquiries efficiently and promptly. Our service provision officers are well regarded by our clients who endeavor to establish a rapport and confidence with our client friends. We value our reputation and your involvement with our company is well regarded and cherished. It is certainly not regarded lightly! Peninsula Dairies has sixteen(16) employees, it does also provide work experience opportunities, furthermore, we have ten(10) well kept refrigirated trucks servicing the entire Mornington Peninsula and beyond. Peninsula Dairies conducts its business under the “Dairy Food Safety Victoria Licence” which regulates our industry. You will gather from all of the above that we provide an excellent, efficient, and well regarded “first class” service.